How to Get My Car Ready for Winter Driving? 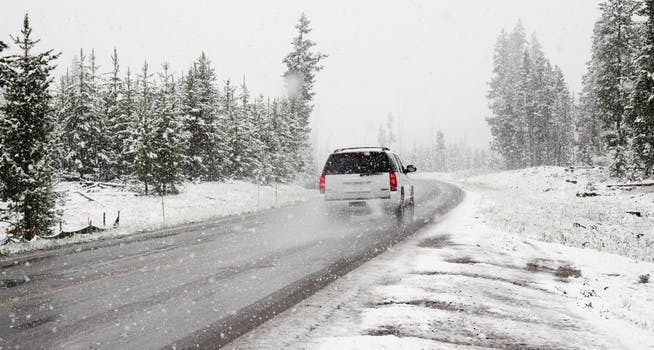 The cooler weather is upon us already and before you know it the snow will fly, causing tough road conditions and an increased risk of getting into an accident. Living in Iowa usually means cold, harsh winters and the freezing temperatures that winter brings can be harmful and damaging to our cars. Before winter comes you should make sure your vehicle is in proper condition for your own safety and the safety of others. If you fail to maintain your car properly during the winter you may be a hazard and cause an accident that could have been prevented. Brakes: If you are hearing any noises or having trouble stopping you need to have them looked at right away. Faulty brakes could be deadly on icy roads! Lights: All lights such as brake lights and headlights need to be working at ALL times. During a blizzard this is often the only way you can see other cars. If your lights are out you might get hit. Engine: If your engine seems to be stalling or experiencing hard starts you should get this checked out and have it repaired. Below freezing temperatures happen quite frequently during the winter months in Iowa and are not easy on your vehicle’s engine. Battery: Check your cable connectors, battery fluid, and battery posts. Having your battery die in the middle of a snow storm would be dreadful, especially if you have little ones in the car with you. Tires: This is a major one. You need to examine your tires to check their tread life and if there is any significant wearing. Having good traction on icy or snowy roads could save your life. You should also make sure they are properly inflated. Windshield wipers: Make sure your blades are working properly and that they come in complete contact with your window. If they are falling apart or dried out they need to be replaced. This will give you a clear view and help to keep snow and ice off your windshield. Make sure you have plenty of wiper fluid to keep your windshield clean. Heater/Defroster: When preparing your car for winter you should also make sure that your heater and defroster are properly working. If you don’t have a defroster your chances of getting into an accident will increase significantly because more than likely your visibility will be reduced. Also, having heat in your car will keep you and your passengers warm in the cold winter temperatures. Emergency Kit: During the cold months it is a wise idea to keep a safety kit in your car in case you are in an accident or stranded somewhere. A winter safety kit might include items such as gloves, boots, blankets, water, snacks, and a flashlight. If you or a loved one has been injured in a car accident we are here to help answer your questions. Iowa attorneys Corey J. L. Walker and Erik Bair practice primarily in personal injury law and offer a book about Iowa car accidents at no cost, risk or obligation. 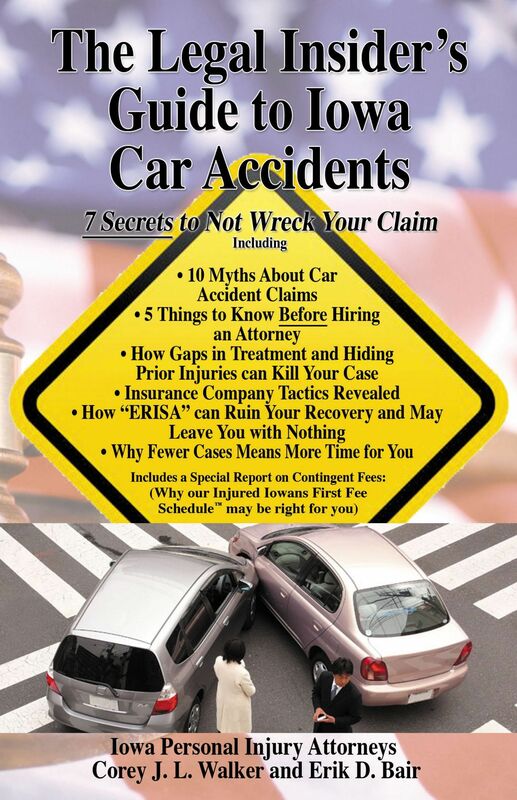 The book is called “The Legal Insider’s Guide to Iowa Car Accidents - 7 Secrets to Not Wreck Your Case." To order your copy go to www.IowaCarAccidentBook.com or Call Now 1-800-707-2552 (ext. 810) (24 Hour Recorded Message). We offer our Iowa car accident book at no cost because we have seen too many hard working Iowans hurt in car accidents who made mistakes, which cost them thousands of dollars. Iowans hurt in car accidents are beginning to realize that the insurance company for the other driver is not there to help them and that they should learn about Iowa's car accident laws. We have offices in Des Moines and Newton, but represent Iowans injured in car accidents from throughout the state of Iowa. For immediate assistance, contact us online or call 515-440-2852 and ask for one of our car accident attorneys.